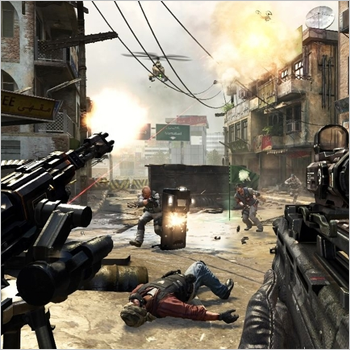 Activision announced today that gamers will soon be able to spend a few dollars more on the Call of Duty franchise. Activision is about to follow EA's lead into the realm of microtransactions as it brings small payments for small things to the very big world of Call of Duty. The publisher announced today that starting tomorrow, gamers will be able to blow a buck or two (or more) on a few in-game upgrades. On the micro-menu are Personalization Packs, which will sell for 160 Microsoft points (that translates into $2 in real money), each with a unique weapon camo scheme, three targeting reticules and a custom Calling Card. For the same price, you can also score the Extra Slots Pack, which provides ten more custom classes, 20 emblem archive spaces, 32 more film slots and 40 extra slots for screenshots in Theater Mode. Can't afford $2? For 80 Microsoft points - that would be $1 - you can pick up the Flags of the World Calling Card Packs to use as your identifier. And although I don't think people generally consider map packs to be microtransactions (it's kind of a blurry line), Activision will also start selling the "Nuketown Zombies" map on the same day for 400 Microsoft points - that's $5 - for gamers who didn't get it free by preordering Black Ops 2. Remember when Electronic Arts found itself the target of much anger and derision over the inclusion of microtransactions in Dead Space 3 and the follow-up claim that gamers actually like them and are "embracing that way of business?" I suspect that conversation is about to get a whole lot more interesting, and it'll be hard to argue that EA is wrong if millions of Call of Duty fans start forking over for this stuff.